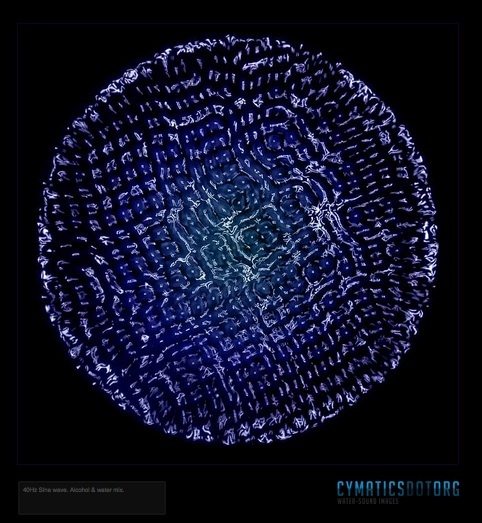 One of the most effective ways to change the energy field is through a science named cymatics. Though he was not the first to discover that sound could heal, Dr. Hans Jenny, M.D. of Basel Switzerland put together some fascinating experiments where we could literally ‘see’ how sound works. What Jenny was observing was really a simple way of observing matter come to life. Since we now understand, through the emerging field of quantum physics, that patterns emerge via waves of energy, the plates were showing the scientist a similar phenomenon. In ancient Sumerian society, this was a known fact. This is why practices like mantra were held in high esteem. The seed syllable, OM, for example, causes a certain frequency to imprint upon the ‘matter’ around it, and thus change the energetic field. “The kind of singing that we do calms the spirit and helps us live in peace with our world and with one another,” says Abbot Philip Lawrence, a scholar of chant who also leads the Monastery of Christ In The Desert – home to an American order of Benedictine monks from Abiquiu, New Mexico. “Chanting has some strange effect on the brain waves according to various studies,” continues Abbot Philip, but this effect is certainly not the Monks of the Desert’s objective; rather their goal, and that of Gregorian chant, notes Abbot Philip, is “to focus on the words rather than the challenge of voice production or sight reading. 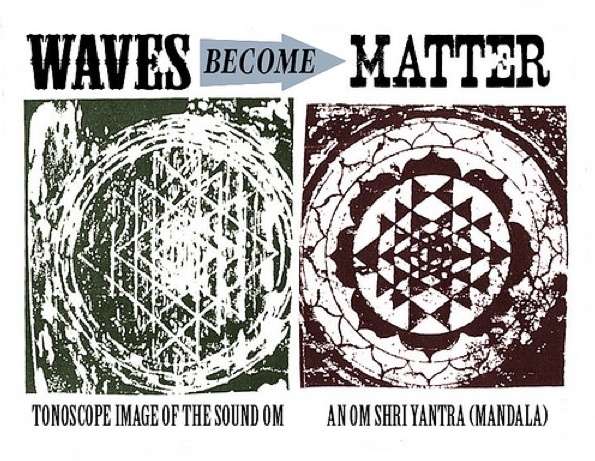 Since all matter is just different frequencies of the collapsed wave, or quantum field, then we have the ability to create a different reality with sound. The possibility for great healing can be seen in the science of sound. 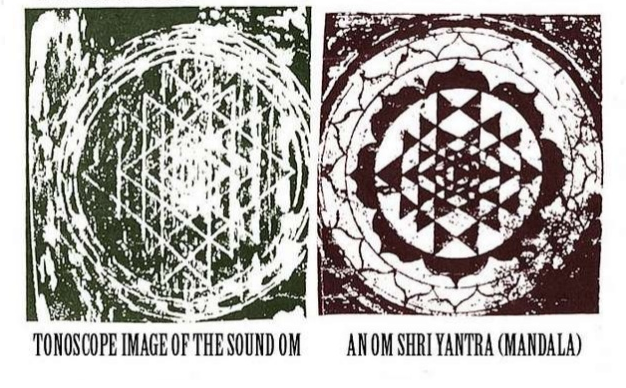 The picture of the Sri Yantra, a mandala created by sound, and said to be imagined by a yogi in deep meditation, is a representation of one of the oldest sounds in the world. Some call it a manifestation of divine sound. The triangles that appear in the Sri Yantra are perfectly integrated based on the divine number, Pi, which is also the basis for the golden mean, Phi. The Greek philosopher, Pythagorus understood sound and divein geometry, and it was written about by Euclid in “Elements” around 300 B.C., by Luca Pacioli, a contemporary of Leonardo Da Vinci, in “De Divina Proportione” in 1509, by Johannes Kepler around 1600. Many others knew of this ‘cosmic’ mathematics, and its power to heal throughout the ages. The harmonics of sound work to create order out of chaos. Disease, you might say, is a form of chaos in the body. According to Dr. Robert Friedman, the connection between the Golden Ratio and ideal health was a no-brainer. During his medial residency in the 1980s, Dr. Friedman began observing the Golden Ratio throughout the human body—on the anatomical, physiological, and molecular levels. – R Gordon. They are like a crack in a perfect quartz crystal. Over millennia, those who have studied the science of sound, have come to understand that certain frequencies are very healing for the human body. Overall, however, you are trying to create resonance – “When two systems are oscillating at different frequencies, there is an impelling force called resonance that causes the two to transfer energy from one to another. Certain frequencies are very healing for the human body. 639 Hz – This is the vibration associated to the heart. It allows feelings of love for self and ‘other’ until there is no longer a distinction. To balance relationships, listen to this frequency. 963 Hz – Activates the pineal gland, and aligns the body to its perfect, original state. Of course, there are further frequencies, many of which that are not even within the human range of hearing, but they are healing nonetheless. George Lakhovsky, a Russian engineer understood the power of sound as well. He understood that certain frequencies would make a living being grow stronger. I hope you are able to find healing in the frequencies I’ve described, and that this introduction to why sound heals will spur you to learn more. At the root of all power and motion, there is music and rhythm, the play of patterned frequencies against the matrix of time. We know that every particle in the physical universe takes its characteristics from the pitch and pattern and overtones of its particular frequencies, its singing. Before we make music, music makes us. ~Joachim-Ernst Berendt, The World is Sound.
? The Number One Thing Psychiatry Can Learn From Shamanism Elon Musk Is Sending A Group Of Engineers To Thailand To Rescue Trapped Soccer Team ?